This is a repost of a popular DIY post from 2008. The train table, by the way, is still going strong and is now used as a Lego table. 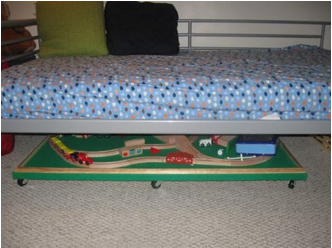 My son’s Papa made this under-the-bed train table for my son’s third birthday. It slides right under his twin bed when he’s not playing with it. That means when it’s not in use all the train pieces are out of sight and it doesn’t take up any space in his bedroom. 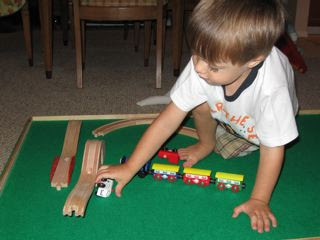 When he’s older, the train table can become a Lego table or a place to store puzzles in progress. One sheet of sturdy plywood (3/4 to 1″ thick). Double check measurements and height to be sure it will fit under the bed and that the train set will fit on it. We had a particular train set picked out already and based the size of the table on the advertised size of the train set. Have your hardware store cut the plywood to the proper size. Ours is 32″x48″. 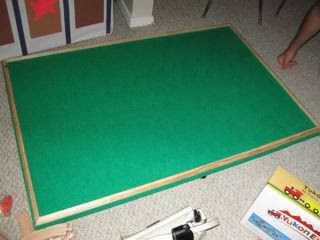 Green Felt – you can use a staple gun and/or glue to affix it to the plywood underneath. Six casters – the ones used here are pretty wide to allow for easy rolling on carpet. We could have used four, but six prevent sagging in the middle. They attach to the bottom of the plywood with screws (so you’ll want a screw gun or similar power tool on hand). Put one on each corner and the other two in the centers of each long side. All are about an inch from the edge of the plywood. Wooden trim – we used “quarter round” trim moulding, which you can have cut to correct sizes at your hardware store. It’s put on with trim nails. You don’t need the moulding, but it keeps all the pieces on the table. Thanks for this post!!!! I may attempt to make it a Mommy & Me project for my 3 year old who loves to build things. This is AWESOME!!! I’ve been wanting to get one for my kiddos but we don’t have the room for one. This would be perfect! What a great idea! My son has tons of room under his bed and this would be great for his GeoTrax sets. Then when he takes hours and makes a huge track and wants to keep it up for days it isn’t in the way. Thanks! This is an AWESOME idea! We’ll be making one next weekend, thanks! perfect project to keep my FIN out of trouble during his 2 week long visit! We still have ours based on the original post, still going strong and super fun!